This Tomato Feta Pasta Salad is the perfect make ahead side dish recipe! Great for camping, picnics, or any summer gathering! This pasta salad recipe is amazing. It is simple to make and tastes better with age. Which means you can make it in advance and pull it out when you are ready to eat! I think that is the case with most pasta salads. The longer they sit the more time the ingredients have to meld together and create a flavor explosion. That makes them ideal for picnics or even camping. Make them the day before and pack them up in a travel container when you are ready to head out! 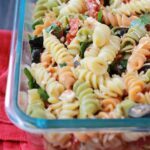 What pasta should you use in pasta salad? What dressing is good on pasta salad? What can you put in pasta salad? Cook your pasta according to the package directions, drain. Stir together the remaining ingredients, drizzle with dressing, and toss to combine. Cook-Toss-Enjoy! If there is too much, or too little, of an ingredient you can put more in or leave some out. If stored correctly, your pasta salad will last up to 7 days. I find that it is questionable after 5 if you add any meats. This is my go-to recipe for barbecues and pot lucks. The bowl is always left practically empty and the recipe is requested. If you decided to use this as a dinner option I would add a little shredded chicken. That way you get a more filling dish. Or use this as a side to go along with one of the many tin foil dinners I have on the site! Cook your pasta according to the package directions. Drain well and cool. Combine all of your ingredients in a large container. Mix together. Refrigerate 2-4 hours before serving.